First boat, second. – Dirty wet dog , boats and sailing. This is the second post in a series about small boats that could be considered as ‘first’ or starter boats or just good all-round small cruising boats that could also become long term boats. I have been thinking about this series of posts for a while as it ties in nicely with the fact that most of the boats that i think of as starter boats are also the kind of boats that i either have considered owning myself or are boats that i have liked when i have seen them or sailed them. There are several approaches i could take here, one for example is the budget approach ie “what can we get at X budget” and that is an approach i took when saving towards my first cruising boat. Another approach is to define what features or qualities we want in a starter boat, it might be for example that the boat, like mine, has to be able to live in a mud berth and sail in shallow water. In this post though i am going to start from a completely different angle and just feature one boat that sails well, that i like the look of and which i think could make both a good starter boat and a long term boat. 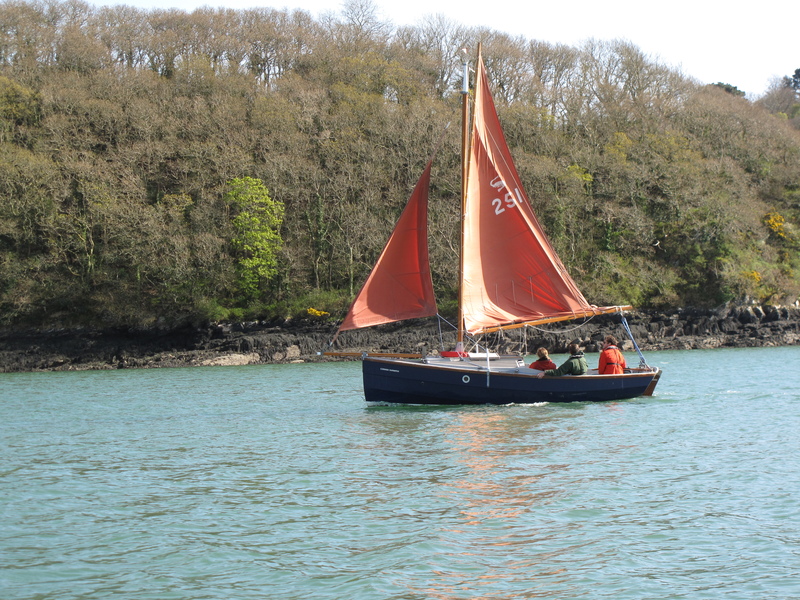 The boat in question is now quite an old design from the Cornish Crabbers range : the Cornish Shrimper 19. It seemed neat somehow to start with a local design, they were designed down this way, built down here and many of them sail locally and i know that they cope well with sailing conditions here. I have several times nearly bought one of these, i have put bids in twice on one of these on Ebay and pipped at the post on both. For their size they can be expensive little boats but the positive side of that is that they then seem to hold their value well and usually re-sell quickly. The original boat was designed in 1978 by Roger Dongray as a boat for himself and built in plywood. Ten were built in ply before Cornish Crabbers added them to their range and started building them in GRP. I see these boats pretty much everywhere i go in the Liberty, although the 2 Cornish Crabbers boats above are the larger 24′ foot boat there are a couple of Shrimpers in the Exe and then i just about every port and river i visited this year. There is a whole fleet of them that race as a class in Falmouth and they are raced competitively. Having visited the Solent, the East Coast, Poole , the North-west coast and Windermere this year i distinctly remember Shrimpers either on moorings, on the mud or on trailers in each of those places. Not far from here there is one sitting on a trailer in somebody’s drive which is what i considered doing although it would i think have been the absolute limit for the size of boat that i could get on our driveway. The useful point there is that the Shrimper is small enough to tow behind a reasonably powerful car and in many cases can live on a trailer at home, that of course makes them an excellent trailer-sailer or dry stored trailer at a boatyard and easy to launch and retrieve. This one i spotted at Mylor up on blocks about to have some maintainence on its centreboard last year. The owner of this one only day-sailed it but liked it as a basic boat to introduce his kids to being out on the water and small enough to handle the boat and manage the children. I had to borrow this photograph of Shrimpers racing. So let me explain why i think the Shrimper is a good starter boat. At 19 feet its a boat that can be easily sailed singlehanded because all the gear and sails are small and light, equally though there is enough work to do for a sailing couple and/or enough space to take the kids out for the day. The initial cost of the boat is higher than many boats of the same size but these are a quality boat to start with and at that size gear isn’t that expensive to replace. One good exercise when thinking about buying boats is to get a good idea of the cost of a set of sails : most sailmakers should be able to quote instantly for a well known class boat such as this one. Another of my budget specifics is how much a really good anchor would cost as i anchor out a lot, in this case an absolutely top-spec anchor (even over-size) would be a good thing to figure out. Another cost, perhaps the greatest long term cost, is the cost of mooring and that almost always ties directly to boat size except in the case of the Shrimper it could live on an expensive swinging mooring but would be fine on a mud berth or drying mooring and they are always a lot cheaper. Equally the boat could live on a trailer at home or be dry stored at a boatyard, either of those options saves wear and tear on the boat, reduces maintainence and usually means that the boat can be quickly moved to a new sailing area. It used to be the case that many people would get their first sailing experience in Dinghy’s, that seems to be less common now and that more people now come to sailing later on when maybe they don’t have the agility for dinghy’s. The Shrimper is quite dinghy-like except that it is larger and much more stable, is responsive but not as ‘twitchy’ as most dinghy’s, has much more cockpit space for larger people and also has a small cabin just big enough to cook a meal, make a brew and sleep in. The boat is small inside for large people (like me) but then i have also sailed alongside a Shrimper with a small lady owner where the boat/owner size looked a good match. I had a quick search to see how many Shrimpers are on the market today and what kind of price range they are as well. There are different versions, the basic boat that i am thinking of as starter boat is the early version with an outboard motor although there are much more expensive models with an inboard engine. The main reason i like these boats is that they sail well given their size, keel and rig combination. Almost the last time that i sailed my Frances 26 i left port just ahead of Shrimper and was making a downwind but up-tide passage back towards Plymouth in a light to moderate breeze. On that occasion as soon as i had some offing i set the windvane up to steer the boat while i relaxed and watched the world go by. The Shrimper was easily keeping pace with me although inshore of me and possibly in less adverse tide. When we got a bit more breeze the Frances would power-up and pull ahead with its longer waterline but as soon as it dropped the smaller and lighter Shrimper would catch up again. In fact having left port together we anchored within a few minutes of each other. At anchor the Shrimper’s lady owner seemed comfortable aboard her boat as i came past to anchor in slightly deeper water and the only real advantage i had then was the much greater space and comfort (for me) of my larger boat.